DECOR: Pier 1 Imports meets Japanese tea room. INTERESTING THING THAT I NOTICED: They have a sushi roll called "The Santa Ana". It's topped with salsa. COST: $50 per person for six courses with a mix of cooked dishes from the kitchen and raw ones from the sushi bar. There was also an option to do all sushi, or all cooked dishes. Though $50 was the minimum, you could upgrade to bigger meals for a nominal fee. A long plate with three cold dishes. Enoki Mushrooms with Boiled Greens. A tiny portion that could've been mistaken for garnish. We finished it in two bites. Ankimo (monkfish liver) and Ponzu. Ate like hard-cooked egg yolk. A puddle of ponzu beneath mitigated its richness. Oyster Cooked with Miso Paste. I could've easily consumed two more. Make that four. No, actually six. It looked like it came out of ticker-tape parade. Strands of daikon, unidentified red strings of vegetable matter acted as textural add-ons and confetti. Not sure why, but it reminded me of sauerkraut. Bits of nuts were sprinkled on for crunch. Disconcertingly, the fish was lukewarm. Sauteed Abalone in Foil with Asparagus, Mushroom, and Broth. Biting down on the abalone was like gnawing on old gum. It made us wonder: "Is abalone always this chewy?" The veggies and the broth saved the dish, barely. Assorted Sushi with Six Pieces of Nigiri and Two Cut Rolls. All amazing. Arabian shrimp was the best. It was pallid like a ghost, opaque grey in parts and scorched by torch in others. 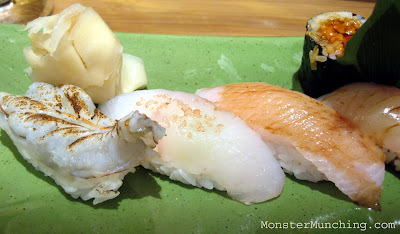 The rest of the nigiri had playful Jell-O consistencies, were slick as an oiled inner-tube, or melted like ice cream. Cut rolls had a core of uni (sea urchin roe) -- always a winner as all things involving uni are. Chawanmushi, Japanese Savory Steamed Egg Custard. Shrimp, fish, and mushroom hid beneath the quiver of barely set beaten eggs. Eating technique was to blow and slurp carefully lest you want your tongue to suffer first-degree burns. Panna Cotta with Red Wine and Berries. Wiggled like gelatin with the constitution of a cheese cake. Quite possibly one of the best panna cottas I've ever had. The pudding was creamy without being cloying, and the thin pour of wine over the top was a stroke of genius. Bitter, sweet, tart, wonderful. CONCLUSION: Was still hungry. Next time, I'll do the all sushi-omakase. Will leave the cooked stuff to izakayas. And so much for being brief! *Special Thanks to Monster Munching reader Alosha (a.k.a. Melissa) for the tip. The panna cotta sounded great ! I've just never learned to like sushi, but wanted to come by your blog and say hello and happy Saturday anyway, Elmo ! the sushi looks great! i've been trying to find a good sushi near my workplace..
btw, are you indo? i noticed reviews on a bunch of indo restaurants. have you tried java spice in rowland heights (i think it's still open?) best ayam calasan ever! It was! I'd actually come back just for that panna cotta. Strange, because I've never seen a sushi joint that does more than mochi ice cream for dessert, let alone something this delicious and well-executed. Yes! Guilty as charged. I am Indo. Although if you Google my real name, I am NOT the same guy who lives in San Jose. Odd that we have the same name and are both Chinese Indonesian. I've tried Java Spice. It ain't bad at all! I love, love, LOVE uni! Everyone else I know hates it. Even my Japanese friends. always enjoy reading your food blog. Didn't know you are Chinese Indonesian :-) Java Spice is pretty cool, I live roughly 15mins away from there in Walnut. It's a very un-notice restaurant in an un-notice area. I was on my way trying to go to AMF bowling lane to buy bowling shoes, and searched around locally for Japanese food before I took off from office. It was seriously a pleasant surprise for me on their food! Sadly... that AMF bowling lane been turned into a Best Buy. What a bust... dang google map search!!! hello, Good descriptions of food and restaurant. I have been reading your post for a few months. I wonder if there was a restaurant you visited and hated. It seems like you are very "positive" when it comes to food. All this talking about sushi is making me hungry for fish. Wonder if you have visited the Dory fish market at Newport. It's a GEM! These courses on the omakase sounds great. It's usually a crap shoot with an omakase because you get burned on the price if you like the food. If the price is low, maybe you won't like it. I'm glad for $50, the feast looks to be worth the price. But this reminds me of that time that we raved about the fish tacos at Los Cotijas to Christian and then he went and they were ehhhh. If I had thought about it beforehand, I would have *highly* recommended sushi only. I was actually annoyed at the amount of hot dishes we got, which is why after they tried to end it, I was like "uh uh, no way, give me a LOT more fish." And THAT was worth it because I ended up paying only $25 more for probably another $50 worth of fish. Still, since I hate to do a repeat, I think I am going to try Sushi Wasabi soon, so closeby as you well know, and maybe one other one for my birthday this next year (in May( like Ikko, or Angotei if I can handle the wait. been there. super overrated on yelp. omakase @ sushi wasabi in tustin is waaay better!!! wife and i went to s.w. after you're review. that place is a true gem!!! I've driven past this place a few times and wondered what it was like... Thanks for the posting. So conclusion is "worth trying"? Meaning it's not a "don't waste your time"
BTW: in Japan it's quite common to get Western style desserts with a Japanese spin on them (slightly)... I've actually had some of the best Italian and French desserts in my life in Tokyo (at either Western or Japanese restaurants). Agree that most here it's Mochi ice cream or Green tea ice cream. Japan went far beyond that years ago. I'm with ya sister! You can take away toro, unagi, hamachi, everything I love about sushi, but uni, that's what makes the cake. It's like the skin on fried chicken, the pepperoni on the pizza. Essential! That's one I've never heard of before! And it sounds like they do sushi AND izakaya! I like the name too! A master-less samurai! It is now on my long list. Thanks for the suggestion! Now if there's ever a sushi/bowling alley, you also be sure to let me know! You got me. I do try to avoid writing about restaurants or places that I don't like...I'd rather highlight good places rather than tear down the bad ones. However, if I find a place is particularly egregious, then I let loose, simply because of my need to release my frustrations -- sort of like a cathartic therapy. Here's one you might have missed from a couple of years ago. My review of Tao Asian Bistro in Vegas. Well, there were aspects of this omakase I didn't like. The abalone. The scant portions of the first course. The lukewarm-ness of the sashimi dish. But I LOVED the sushi. And by the end, I wasn't full. As Melissa said in her comment, Murasaki's strength is in its sushi and I think I only got a brief glimpse in the omakase I had. So it would've been worth it if we opted for ALL SUSHI. Yup. We debated asking for more fish. But once we had that dessert (which again was amazing), our palates closed up -- it would've been hard to get back on the saddle for sushi -- even though our stomachs could've used more. But you're right. As I told Pepsi Monster, their strength is in their sushi bar. I mean, seriously, have you ever seen an Arabian shrimp in your life before? That was exciting and new to me. The cooked items were fine (except for the abalone), but I've concluded with this experience that unless the chef's name is Abe and the restaurant is called Bluefin, no cooked dish in omakase could ever impress me. Funny enough, Bluefin's sushi course is their weakest link in their omakase. It's the reverse here. I think you'll like Ikko. Ikko is great...but they too have a fault (although some people might not call it that) in their omakase -- they're too much in love with foie gras. Now I've rambled too much! What is it about sushi that inspires so much awesome and thoughtful discussion! 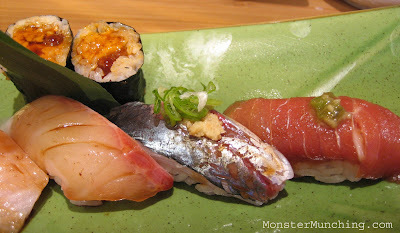 Have you tried Sushi Shibucho? I was there this weekend (also omakase) and I'm smitten all over again (my review in 2005). Check this out: Octopus braised in ginger as appetizer. A bowl of boiled greens. Fifteen (or sixteen) pieces of different nigiri, including uni, unagi, toro, etc. Miso soup. Hot tea replenished constantly. $33 per person (sans tax and tip). The price went up ONE SINGLE DOLLAR since 2005. And they added a dish! I wouldn't say "don't waste your time" with Murasaki. The sushi I had was terrific. Definitely "worth trying". But stick to the sushi. Their cooked stuff isn't so great. Avoid that abalone dish for sure. Though the veggies were nice. Sushi Shibucho! Yes! When I was listing my places to try yesterday, I remembered there was one omakase review you did that I loved and I couldn't remember the name of the place. Noted! I wish I could do this all the time too. I didn't mention it, but I was being treated for my birthday. So I didn't have to pay for it. Ultimately, that is the best way to enjoy omakase!!! I bet it is! Out of curiosity, how much is it? Be sure to go hungry when you go to Shibucho. He won't let you leave if there's still space to be filled in your stomach! I certainly would avoid the cooked dishes...but the sushi was great. Just wish it was less expensive. I usually leave those omakases hungry.. especially for the price. Yeah, for $50, I would've expected to at least, be full. I am at other omakases...but not this one. That's the part that bums me out.